This month, the I made it challenge set by Blue Jelly Beans was for croissants and pain au chocolat. I had already made croissants using a Viennese recipe and so I decided for the pain au chocolat I would use the Parisian recipe. I also changed how I rolled up my croissants as per my notes in my recipe. However, what I did not take into consideration was the weather. Dave had opened the upstairs door and the downstairs window and this created a wonderful through draft – right across the very space I had placed my bowl onto. I chose a nice warm spot that gets all the morning sun, in my dining room, as the weather was rather chilly. However, the cool breeze ensured that my croissants did not puff up very well. They did however taste very good, and I will make pain au chocolat again as they make a great afternoon tea treat. I have to add that the taste was as authentic as I have ever had in France and I think that it had to do with the milk chocolate that I use. 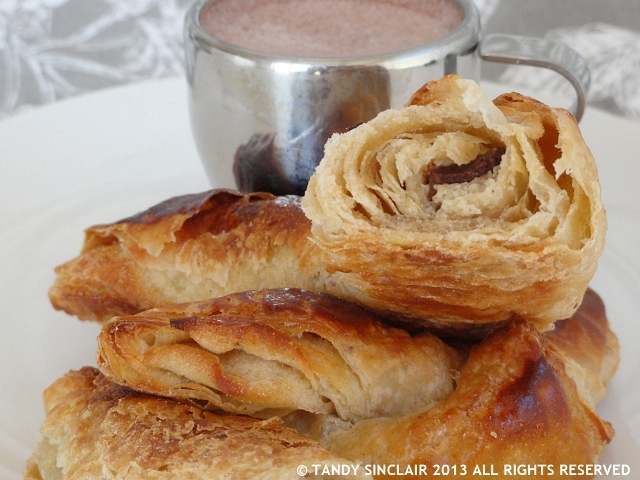 This added just the right note of sweetness to the pain au chocolat. I use Canderel chocolate as it is sugar free and when I am overseas I buy the Lindt sugar free chocolate. which brand of milk chocolate is your favourite? You make it sound so easy! I’ve never tried making croissants or pain au chocolat at home before, as I thought they would be a disaster, but maybe I should give it a go! Lovely home-made pain au chocolat! Here in Belgium, you see mostly pain au chocolat with 2 chocolates in them: double yum! Your pastry looks golden & crunchy! Now, I could go for your version! Tasty croissants for Sunday mornings! They look lovely, I really need to attempt a recipe like this soon! They are awesome to make – and eat of course! Looks yum!! I am not a huge fan of chocolate, I use dark chocolate a lot as it is not to sweet.